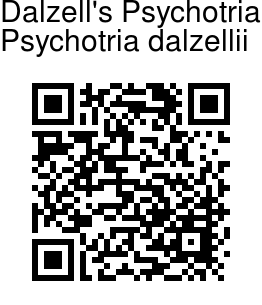 Dalzell's Psychotria is a shrub or small tree, 4.5-6 m high; branchlets stout, smooth, hairless. Leaves are opposite, 7-25 x 4-10 cm, obovate, oblanceolate, obovate-oblong, obtuse, rounded or apiculate at tip, cuneate at base, leathery, hairless, pale green, midrib conspicuous, lateral nerves 12-20 on either side. Leaf-stalks are 0.5-2 cm long, stipules 1.5-2.0 x 0.8-1.5 cm, ovate, oblong or orbicular, coriaceous. Flower are borne in terminal, brachiate paniculate cymes, 4.5-10 cm across. Primary branches are 4-5 at a whorl, subtended by 4-5 large bracts; secondary branches 3 or 4-5 at a whorl, subtended by 2 bracts; branches and branchlets long, ascending, slender, glabrous; heads 4-8 mm across; peduncles 2-7cm long, glabrous; bracts persistent, 5-10 x 5-6 mm, ovate, oblong or suborbicular, coriaceous. 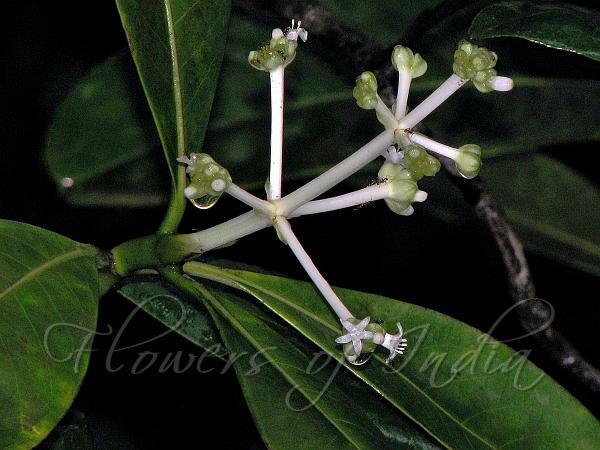 Flowers are 8-10 mm long, heterostylous, white, tubular, bracteolate. Flower-stalks are 0-0.5 mm long, glabrous. Hypanthium is 0.7-1 mm long, oblong, glabrous. Sepal cup broadly bell-shaped, 4-5 x 3-4 mm, sepals 5, 0.6-1 mm long, oblong, rounded. Flower tube is 3-4.5 mm long, glabrous above, villous at throat within; lobes 5, 2-3 mm long, oblong or ovate-oblong. Stamens are 5, exserted or inserted. Fruit is stalkless, 10-13 x 5-7 mm, obovoid or subglobose, crowned with persistent sepals.Dalzell's Psychotria is endemic to Western Ghats. Flowering: March-November.